This week’s fossils celebrate the publication today of a paper in Nature Geoscience that has been 20 years in the making. The title is: “Sea-level oscillations during the Last Interglacial highstand recorded by Bahamas coral”, and the senior author is the geochronological wizard Bill Thompson (Woods Hole Oceanographic Institution). The junior authors are my Smith College geologist friends Al Curran and Brian White and me. This photograph was taken on the island of Great Inagua along the coast. The flat dark surface in the foreground is the top of a fossil coral reef (“Reef I”) formed during the Last Interglacial (LIG) about 123,000 years ago. It was eroded down to this flat surface when sea-level dropped, exposing the reef to waves and eventually terrestrial weathering. The student sitting on this surface is Emily Ann Griffin (’07), one of three I.S. students who helped with parts of this project. (The others were Allison Cornett (’00) and Ann Steward (’07).) Behind Emily Ann is a coral accumulation of a reef (“Reef II”) that grew on the eroded surface after sea-level rose again about 119,000 years ago. These two reefs show, then, that sea-level dropped for about 4000 years, eroding the first reef, and then rose again to its previous level, allowing the second reef to grow. (You can see an unlabeled version of the photograph here.) The photograph at the top of this post is a small version of the same surface. The significance of this set of reefs is that the erosion surface separating them can be seen throughout the world as evidence of a rapid global sea-level event during the Last Interglacial. Because the LIG had warm climatic conditions similar to what we will likely experience in the near future, it is crucial to know how something as important as sea-level may respond. The only way sea-level can fluctuate like this is if glacial ice volume changes, meaning there must have been an interval of global cooling (producing greater glacial ice volume) that lowered sea-level about 123,000 years ago, and then global warming (melting the ice) that raised it again within 4000 years. As we write in the paper, “This is of great scientific and societal interest because the LIG has often been cited as an analogue for future sea-level change. Estimates of LIG sea-level change, which took place in a world warmer than that of today, are crucial for estimates of future rates of rise under IPCC warming scenarios.” With our evidence we can show a magnitude and timing of an ancient sea-level fluctuation due to climate change. Much of the paper concerns the dating techniques and issues (which is why Bill Thompson, the essential geochronologist, is the primary author). It is the dating of the corals that makes the story globally useful and significant. Here, though, I want to tell how the surface was discovered in the first place. It is a paleontological tale. In the summer of 1991 I worked with Al Curran and Brian White on San Salvador Island in The Bahamas. They were concentrating on watery tasks that involved scuba diving, boats and the like, while I stayed on dry land (my preferred environment by far). 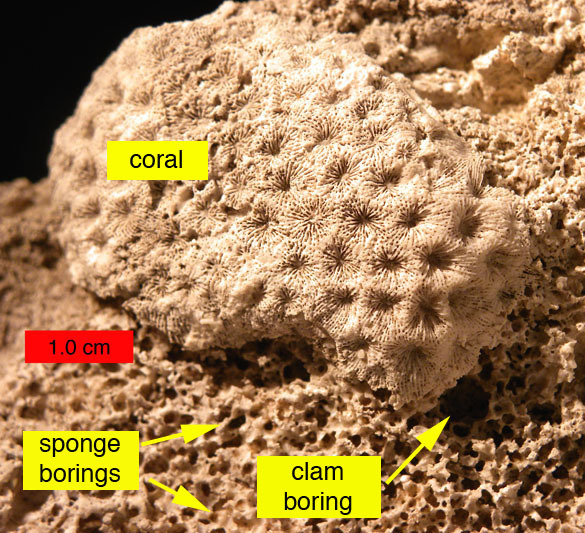 I explored a famous fossil coral exposure called the Cockburntown Reef (Upper Pleistocene, Eemian) that Brian and Al had carefully mapped out over the past decade. The Bahamian government had recently authorized a new harbor on that part of the coastline and a large section of the fossil reef was dynamited away. The Cockburntown Reef now had a very fresh exposure in the new excavation quite different from the blackened part of the old reef we were used to. Immediately visible was a horizontal surface running through the reef marked by large clam borings called Gastrochaenolites (see below) and small borings (Entobia) made by clionaid sponges (see the image at the top of this post). 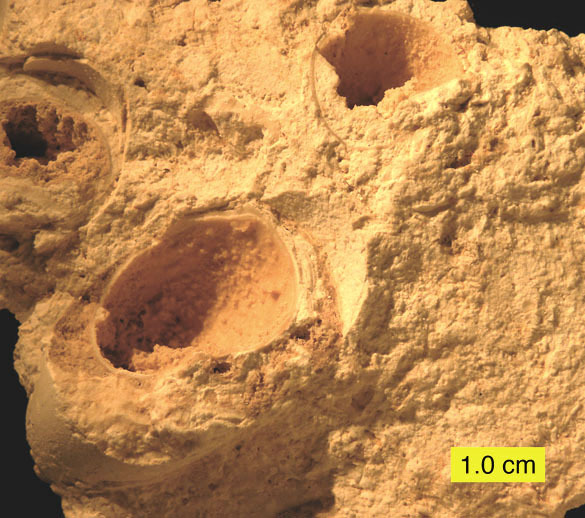 Inside the borings were long narrow bivalve shells belonging to the species Coralliophaga coralliophaga (which means “coral eater”; see below) and remnants of an ancient terrestrial soil (a paleosol). This surface was clearly a wave-cut platform later buried under a tropical soil. My colleagues and I could trace this surface into the old, undynamited part of the Cockburntown Reef, then to other Eemian reefs on San Salvador, and then to other Bahamian islands like Great Inagua in the far south. Eventually this proved to be a global erosion surface described or at least mentioned in many papers, but its significance as an indicator of rapid eustatic sea-level fall and rise was heretofore unrecognized. Finally getting uranium-thorium radioactive dates on the corals above and below the erosion surface placed this surface in a time framework and ultimately as part of the history of global climate change. This project began 25 years ago with the discovery of small holes left in an eroded surface by humble sponges and clams. Another example of the practical value of paleontology. Thompson, W.G., Curran, H.A., Wilson, M.A. and White, B. 2011. Sea-level oscillations during the Last Interglacial highstand recorded by Bahamas coral. Nature Geoscience (DOI: 10.1038/NGEO1253). White, B.H., Curran, H.A. and Wilson, M.A. 1998. 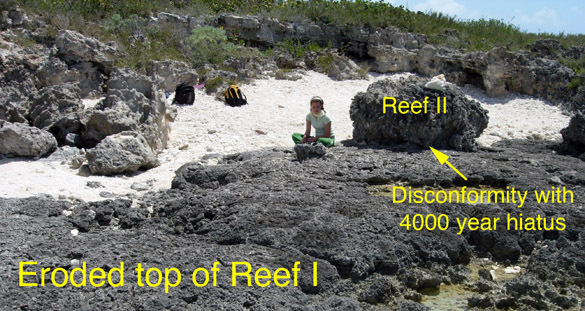 Bahamian coral reefs yield evidence of a brief sea-level lowstand during the last interglacial. Carbonates and Evaporites 13: 10-22. Wilson, M.A., Curran, H.A. and White, B. 1998. Paleontological evidence of a brief global sea-level event during the last interglacial. Lethaia 31: 241-250.